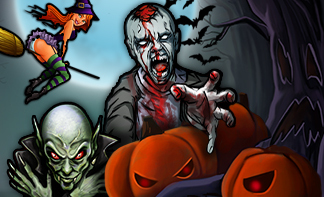 Halloween has passed, but if you are a Club World Casino player you can still enjoy the string of tournaments and special promotions dedicated to this occasion. Obviously, the first instinct is to check out the bonuses to see how to double or even triple your first deposit, but before you do that, make sure you check out http://www.clubworldcasinos.com/SLTournaments.aspx. The reason for why the main priority should be to check out the tournaments listing is that these events are not going to be around for much longer. The online casino has the healthy habit of refreshing its main tournaments just as often as it refreshes its promotions, and some of these events are simply too good to miss. As for bonus codes, the “dangerous spirits” as the Club World Casino guys like to call them are more or less harmless and have the uncanny ability of boosting first deposits. Players get to choose between four distinct bonus codes, with the standard one going by the name of RPLA60NORMAL and consisting of a 60% bonus. If you aim for slightly more generous rewards, feel free to use the RPLA62RISING or the RPLA65CAUTION codes which will match your first deposit by 62.5% or 65%. At the top of the food chain, players will find the RPLA67DANGER promo code and it comes as no surprise that those who use it and have their first deposit matched 67%. The first instinct would be to choose the last bonus code while dismissing the other three as irrelevant, for the simple fact that they offer lower bonuses. The reason for why players shouldn’t overlook them is that the wagering requirements are easier to meet when you have a lower amount to play through. In a nutshell, if you prefer to have some fun online play casino games without having your money blocked in an account for too long, these lower bonuses might be the right ones for you. Each bonus code has a limited availability and even though Club World Casino makes no secret of the fact that they will be replaced by equally generous ones, players should act quickly to capitalize on them. Regardless of how much they deposit and what bonus code they choose, they will have to play through the entire amount 30 times before operating a withdrawal. Any attempt of cashing out before these conditions are met will trigger the forfeit of the bonus, so don’t be hasty and read the terms. This entry was posted in Slots Articles by admin. Bookmark the permalink.